Hammered metal adds a sculptural element to this unique Forged Cuff Bracelet. Designed to coordinate with all the Forged pieces in this new collection, it also pairs well with our other styles of cuff bracelets. Perfect size and great with everything you wear! This cuff is my go-to for layering. It is a perfect companion to every bracelet I own. It is super comfy and I never even know it's there. I adore the hammered look and the brilliant finish! My absolute favorite layering bracelet! Love the hammered look! Love the width/size! I love this cuff. It is great for layering or worn alone. It’s very sturdy and the hammered look catches your eye. 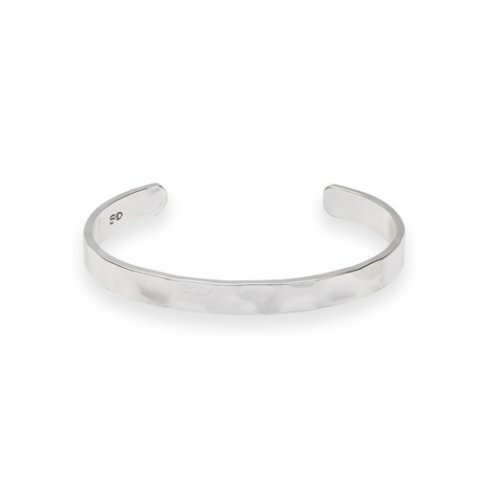 I love this bracelet because with the hammered look it is perfect for layering but also very beautiful worn alone. It is the perfect size for both choices. This is a great piece to go with everything. I have a small wrist, and this bends to fit me well. I love the shine that comes from the hammered finish! This cuff is great for layering with other Style Dots Bracelets or it's awesome by itself. I love wearing it as a watch buddy. You can't go wrong no matter how you choose to wear it. I love layering with the Forged Cuff - goes great with all of my other Style Dots bracelets!